YWCA in Worcester, Applications due by January 31st, 2019. EPIC is coming to Worcester. 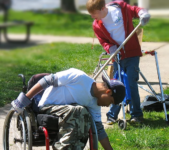 EPIC Service Warriors is a community service and education program for youth with disabilities between the ages of 16-23. * EPIC Service Warriors meet for one year to participate in community service projects in the City of Worcester. * By creating the change they want to see in the world the Service Warriors learn more about local communities and develop practical skills that will help them develop as leaders and pursue future goals. * The EPIC Service Warriors Program runs from April to April. * During the year Service Warriors will participate in an Opening Day/Orientation, a minimum of 12 community service projects, 10 leadership development workshops, and a Graduation Celebration. 3. Be ready to create change in your community and life!